The olive tree has been essential to Mediterranean life for over 4,000 years. In addition to being a staple ingredient of the Mediterranean diet and an ancient trading commodity, olive oil has been used as a medication, soap, hair and skin moisturizer, terra cotta lamp fuel, furniture polish, and for cleaning and waterproofing leather. Olive trees have a strong root system and can live for centuries. It takes up to 8 years before a tree produces its first olives. They grow well in lime and stony, poorly aerated soil, in areas with rainy winters and hot, dry summers. 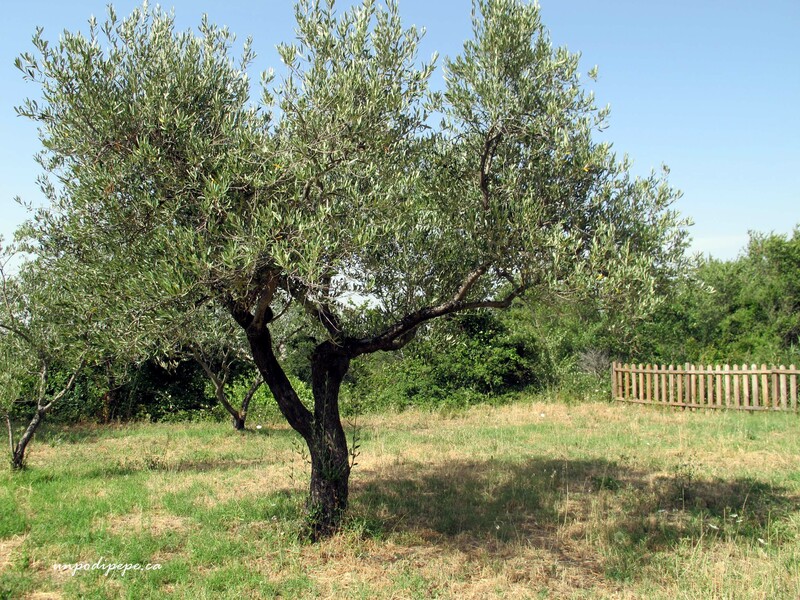 Olive trees have been considered sacred and symbolic. The olive branch has been a symbol of peace and the endurance of life since Genesis 8:11 ‘the dove came back to him in the evening; and, behold, in her mouth was a freshly plucked olive leaf: so Noah knew that the waters had subsided from the earth’. The shape and form of olive trees has always captivated me. I still have not mastered their tangled growth of trunks and leaves with a silvery green underside, but they are frequent subjects in my sketchbook. While in Italia last November, I encountered a lot of olives. Seeing the trees heavy with ripe black and purple olives was new for me, as I had only ever seen them in their small green state! Every road near Orsara di Puglia was full of parked cars where families were harvesting their olives. 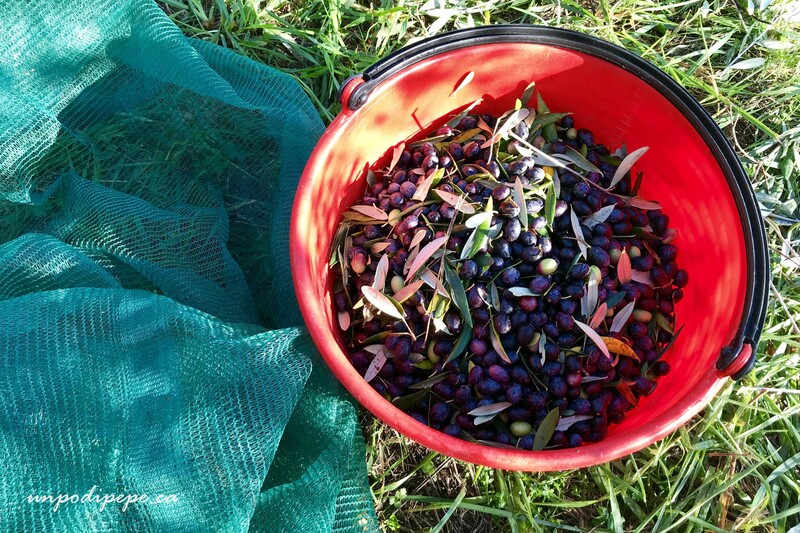 Unfortunately, I missed my family’s olive harvest by one day, but I was in Gugliano near Lucca during their harvest. I used Casa Berti’s fresh olio nuovo to make Olive Oil Limoncello Cake. 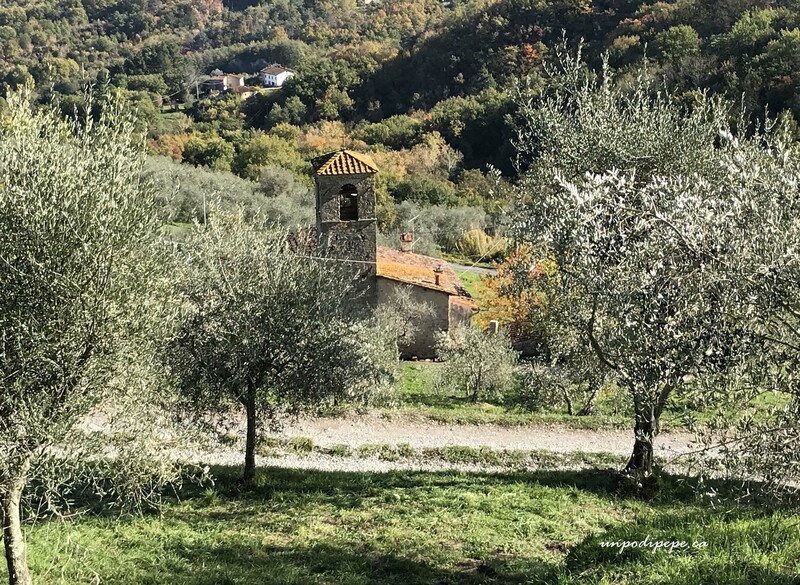 Brucatura (broo·ca·TOO·rah) is picking olives by hand and putting them straight into un cestino-a basket, or a bucket. This preserves the integrity of the olives and does not damage the tree or branches. Ladders are used for the higher, hard to reach branches. This method is slow, with a lower yield, but produces the best oil, with the least acidity. 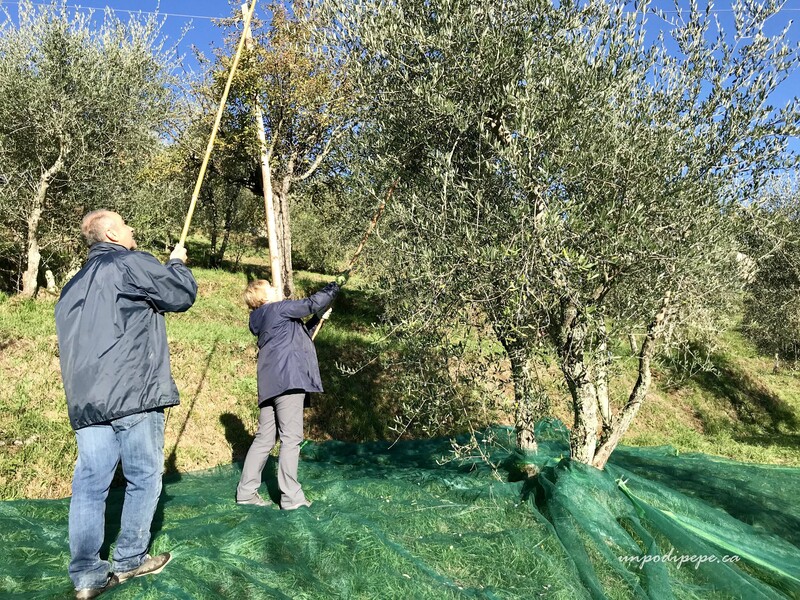 Pettinatura (pet·teen·ah·TOO·rah) is ‘combing’ olives off the branches with long handled combs/rakes and collecting them into buckets or nets. Families producing olive oil for their own consumption harvest mainly by brucatura and pettinatura. Bacchiatura (bahk·kee·ah·TOO·rah) is beating fruit off trees with long poles so they fall into the nets. A long-handled electric version for higher branches looks like 2 rakes facing each other that vibrate in opposite directions. 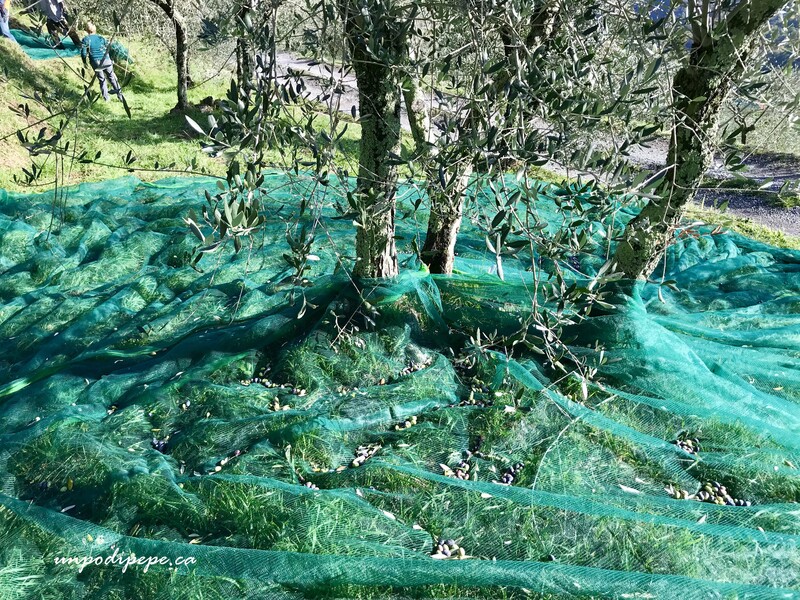 If not done carefully, bacchiatura can cause bruising to the olives and damage to twigs and branches. Scrollatura (scrol·lah·TOO·rah) A mechanical arm attached to a tractor wraps around the trunk and shakes the tree until all of the olives fall off into nets. 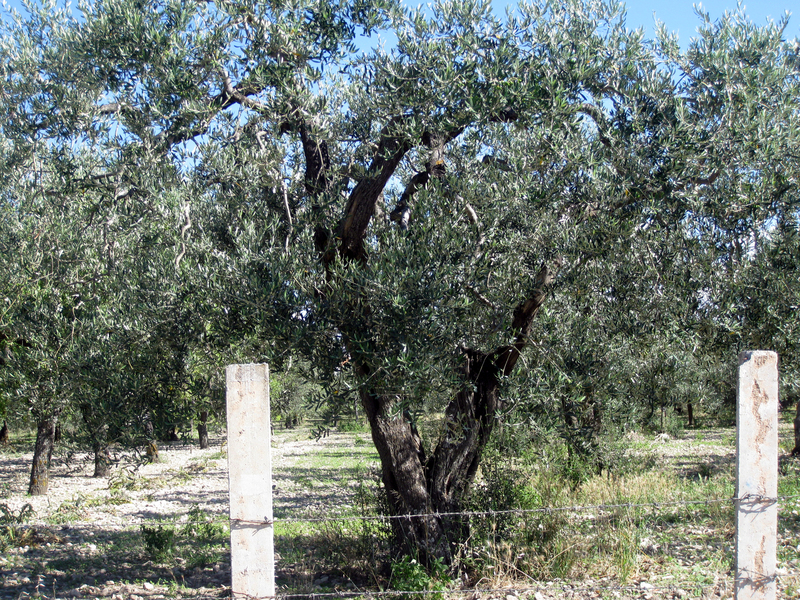 This method is efficient for large olive groves, but damaging to the tree and can produce inferior oil. Luckily this method is not possible on terraced land or if there is not enough space between trees for a tractor. Olives are stored briefly in crates to get warm and release oil more easily. Then they are taken to the frantoio, the olive mill. Pressing within 24 hours of harvest produces the best quality oil with the lowest acidity. One evening while I was in Orsara di Puglia, I was lured by the divine smell of pressed olives. It was the frantoio, which of course is closed the rest of the year. 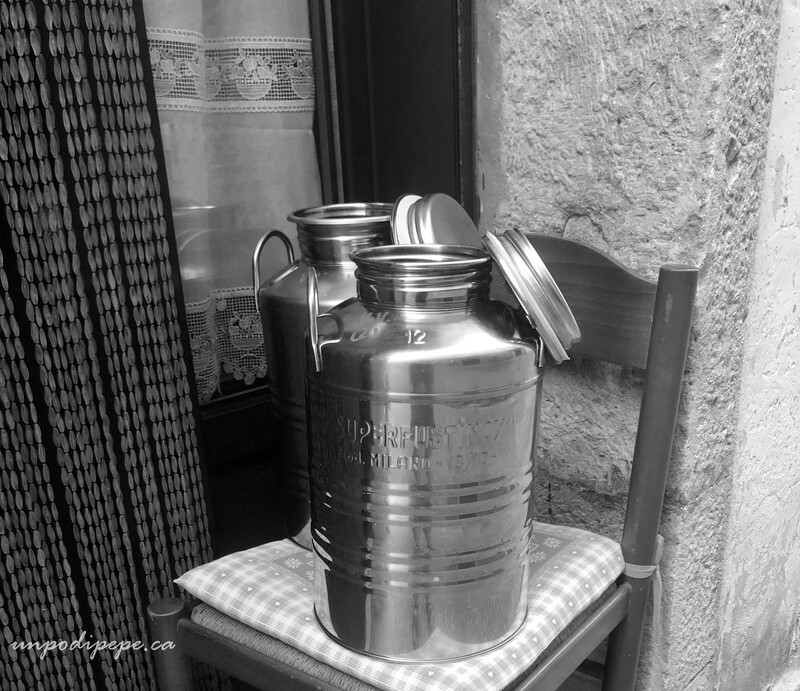 During la raccolta delle olive, it is open all the time and is a busy, social place. The frantoio is as cold as outside, since cold pressing prevents oxidation and preserves the nutrients, colour and flavour of olive oil. I was curious to see the olive oil extraction process. 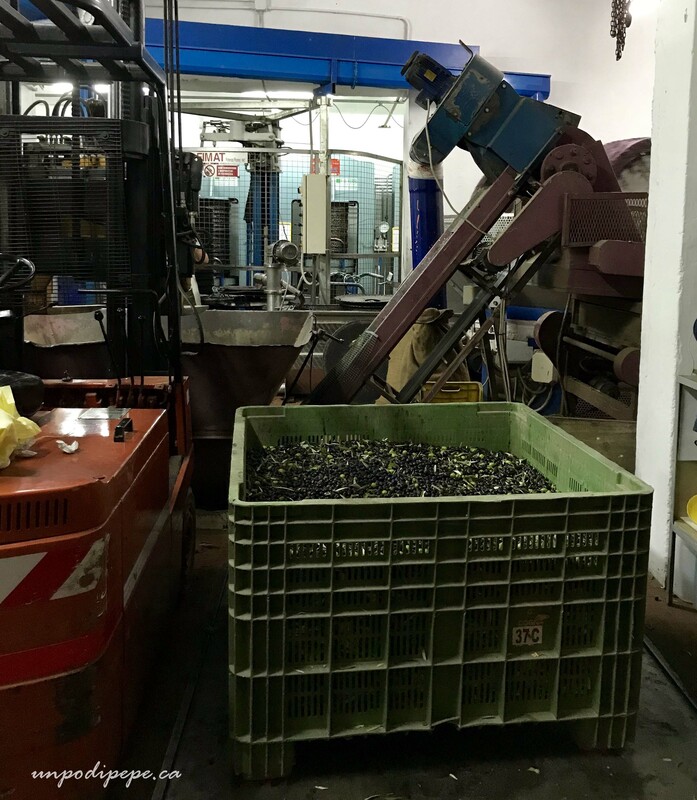 The olives are separated from branches, leaves and debris then weighed, rinsed in cold water and passed along a conveyor belt between rollers. Then they go into a vat with blades that mash or grind the olives into a paste- including the pits! This used to be done with stone or granite wheels like a giant mortar and pestle. 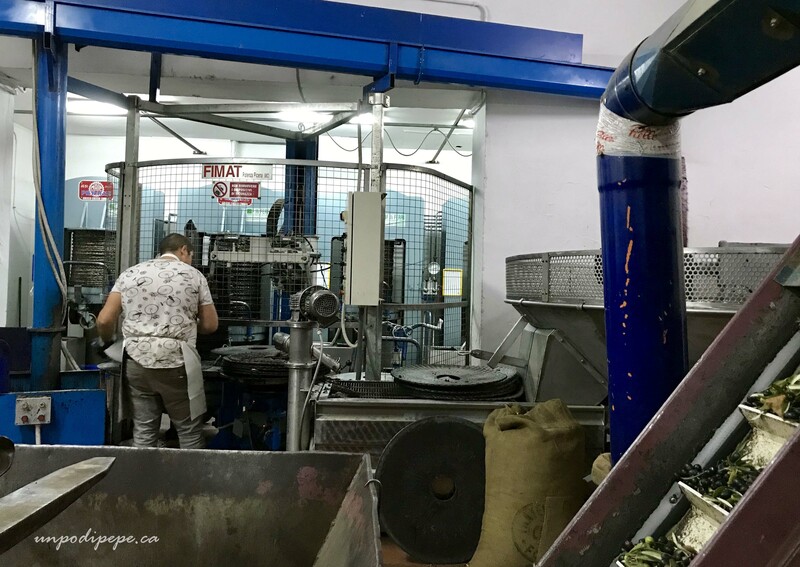 The olive paste is spread evenly over pressing discs/mats, which are stacked onto a press plate to evenly distribute the pressure. The paste is not heated to extract oil, as cold pressing prevents oxidation. Oil and water are separated and sediment removed using a centrifuge, then precious liquid gold, unfiltered olive oil pours out a spout draining into a steel basin. 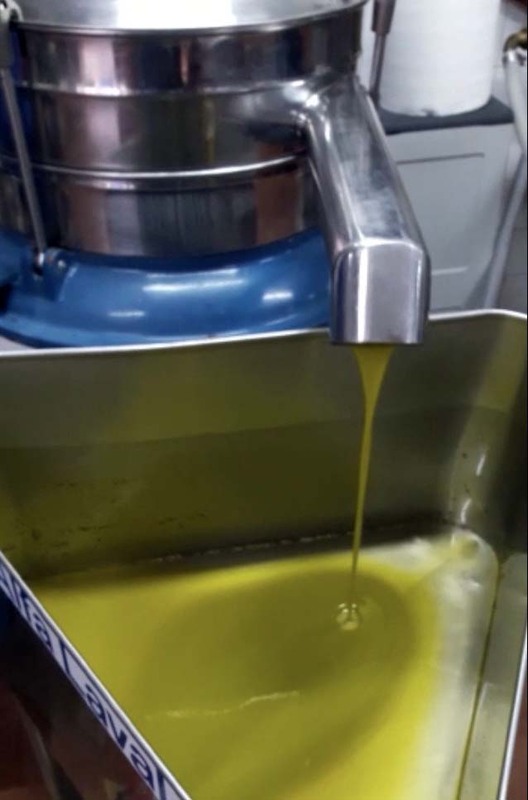 The colour of olive oil can range from grassy green to bright yellow gold, depending on the ripeness and type of olives and the level of chlorophyll in leaves that are included in the pressing. The fresh oil is stored in stainless steel vats until it is bottled. 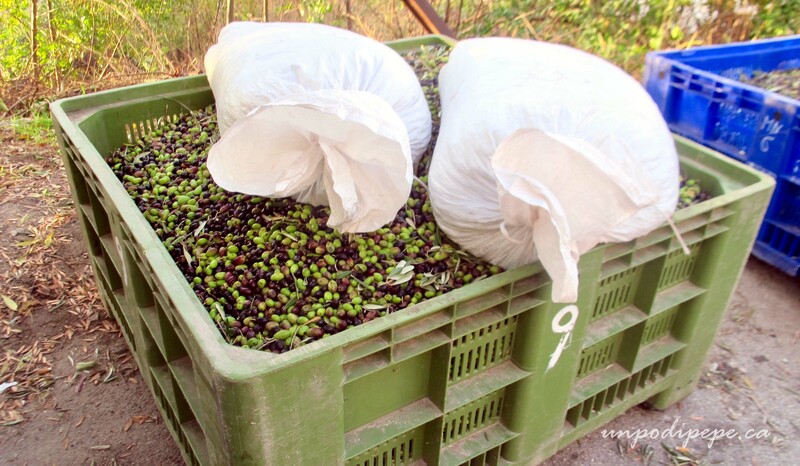 The yield of oil per quintale (100kg/ 220lbs) of olives varies each year. 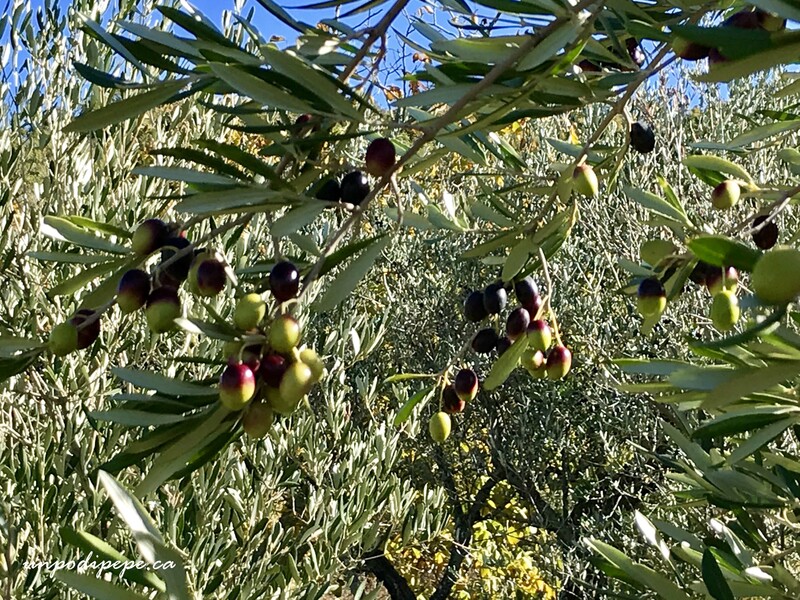 It takes approximately 2,000 olives or 1 tree to produce 1L of olive oil! No wonder it is expensive! The first press is virgin olive oil. It can be designated as ‘extra virgin’ only if the % acidity is less than 0.8% and it has superior taste and aroma. I will discuss this in a future post called Olio d’Oliva. 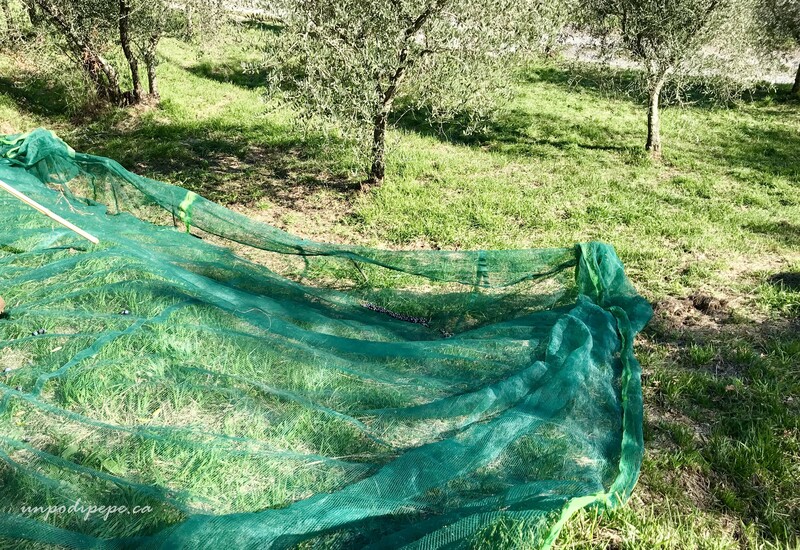 Photos featured in this post were taken at Frantoio Oleario di Nico Manna in Orsara di Puglia, my family’s olive grove in frazione La Cupa, Orsara di Puglia, and Casa Berti in Gugliano, Lucca. What a beautiful post Cristina. I’ve never attended a Raccolta in Italia and have never bothered to learn those particular words. Interesting and great photos. You know, whenever I see that pronunciation guide for the ‘u’ sound as ‘OO’ I cringe a little as this one sound that learners of Italian invariably stuff up. It comes down to lip shape. English speakers always push their lips forward when saying this sound, and it comes out sounding quite un-Italian.Consider the difference in ‘OO ‘ sounds in English- Cook, book,look versus boot, shoot, etc. I was teaching a friend of mine Italian for a year and her pronunciation of Pugla always sounded peculiar, too drawn out- too much emphasis on the ‘oo’ sound: it came out as POO- Lee- ah. It took weeks to get her to change that oo sound, by getting her to relax her lips instead of pushing them out. Just a thought Cristina. Lucky duck Cristina. Yes, hard in writing those sounds for sure. ‘Too’ is a bit like ‘shoe’ and too long for me, but there is a difference in the way that foreigners learn Italian, from country to country. The Brits the Aussies, the Americans, and so on. I am being pedantic I know. I just love the sound of Italian. Have a wonderful visit. 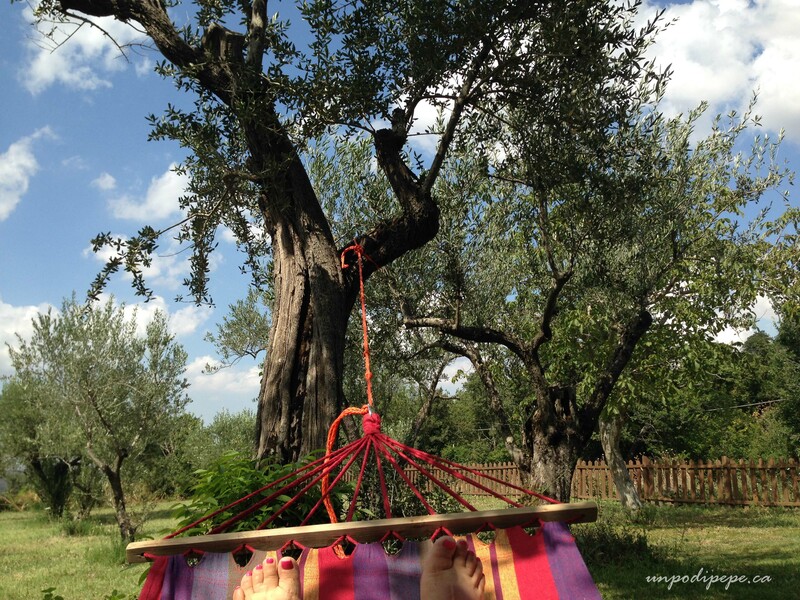 Ciao Cristina, che bello leggere questo Blog post sull’olio. Quest’anno non rieco a compralo dal solito fornitore. Avresti dei consigli dove potrei compralo? Abito in Germania, ma lo potrebbero spedire da mia sorella a Padova. Ciao Cristina, bello leggere il tuo post sull’olio. Io compro sempre quello pugliese, quest’anno non riesco ad averlo da solito contadino. Avresti qualcuno da consigliare? Lo dovrebbero spedire a Padova…. Mille grazie. Sempre bello leggerti…. Wonderful post, so informative with great pictures!